Researches in China believed it would be a good idea to give monkeys human brain genes. 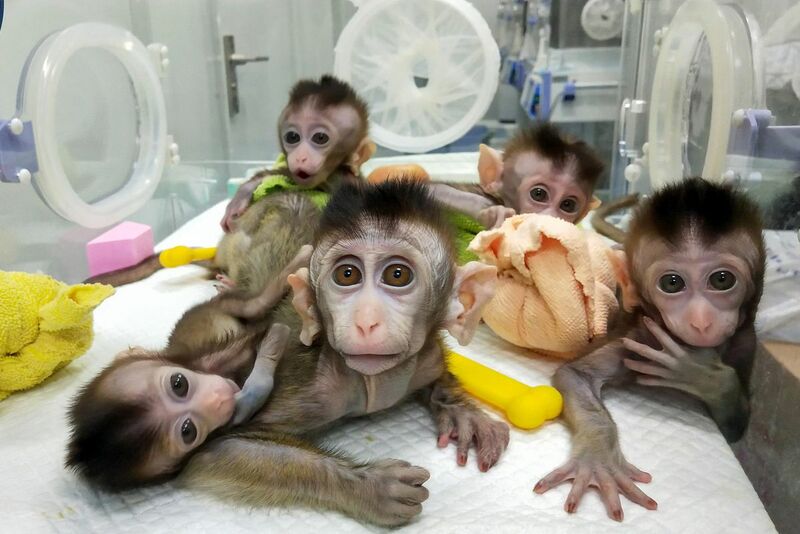 Human copies of the MCPH1 gene were introduced into 11 macaque embryos. This gene is known to have an important role in the development of the brain in humans. This gene was introduced to embryos with a virus that carried the gene. Out of the 11 monkeys, only five survived. These five monkeys were tested, including MRI brain scans as well as memory tests. A controlled group was part of the experiment so they could make comparisons. The results showed that the tested macaques did not have bigger brains compared to the control group. One of the differences was that the tested macaques showed better results in short term memory tasks. Also, just like human brains, their brain developed over a long period of time. The main objective of this experiment, according to the researchers was to question the genetic basis of human brain. How the human brain have its own unique intelligence, which other primates do not have. The experiment was extended by using other genes such as SRGAP2C which is related to intelligence and FOXP2 related to speech and language. If the monkeys being experimented end up being more smart like humans, then where are these monkeys going to end up? most likely locked up. The will not have a normal life or might not even like the same things that regular monkeys like including food. Overall, this is probably only causing harm to the macaques. Of course it would be interesting to learn and research on how evolution happened but what is the cost? very unfair to all the innocent animals. These animals are absolutely adorable and its horrible to think of any mistreatment they are suffering. Ethically its pretty jacked up and with no promise as to finding something worth a living creatures life I would have to say I am not in agreement with these kinds of studies. Just my opinion. This experiment is a perfect example of where the line needs to be drawn in the sand in terms of experimentation on animals. I understand this experiment could have revealed some valuable information to some, but it is certainly not worth subjecting these monkeys to such invasive treatment. While the use of less intelligent animals such as rats and mice for medical experimentation has become widely accepted in science today, this kind of mutilation of these macaques should never be accepted given their intelligence levels and evolutionary proximity to humans. Any experiment that kills half of its subjects is extremely questionable. Besides, I don't really see the value in this experiment even if it was a success.